We are excited to welcome you to our award winning musical theater program! 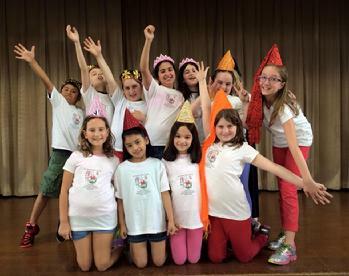 Mike Risko Music, named a family favorite by Westchester Family Magazine for Acting Classes for Kids and Children’s Theater Company, offers students of all ages the opportunity to gain musical theater experience and skills through our classes, workshops and shows. Our programs train students in acting, movement and singing with an emphasis placed on vocal technique and an understanding of music. In addition, our students are trained in microphone use and sound technology. We offer many different classes, workshops and shows for different age groups. We encourage kids of all different ages and levels to be a part of our program which is designed to fit into a busy lifestyle. Rehearsals are once or twice per week with additional rehearsals added in the week before the shows. Whether their goal is Broadway or they are just getting started, there is a place of everyone in one of our programs. Read on to learn about past and future productions. Click here to read about our classes and workshops. Mike Risko Music offers several opportunities throughout the year for young performers to star in a musical theater production. 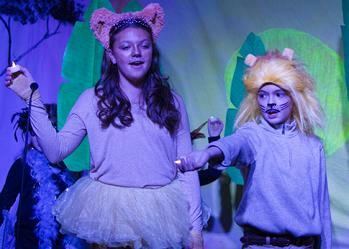 There are opportunities for elementary, middle and high school students to be a part of our shows. We do three shows during the school year and one in the summer. Rehearsals are held in the weeks prior to the show once or twice each week with several performances at the end of the session. This program is designed to give kids and teens the opportunity to be part of a professional show in a supportive environment. Young actors and actresses of all levels engage in a Broadway style experience that not only fosters a love of theater but provides a great social environment. From backstage to on-stage, participants are part of our productions from start to finish. Our productions are geared toward all the elements of musical theater with a concentration on music. Since we are also a music school, all students enrolled in our productions receive the added bonus of vocal coaching during the course of the show. Our staff music lesson instructors work with our vocalists to ensure proper technique, voice training and a professional performance. Some of our musical productions are offered in-house while others are at locations in the community. Programs are offered during the school year and in the summer. Please call us at 914-762-8757 for more information and to register. You can also register for the current production by filling out the form on this page. Read all about our past productions here. Click on each picture to read about the shows. Some of our productions include Aladdin Kids, Sleeping Beauty Kids, Cinderella Kids, Lion King Kids, Annie Kids, The Little Mermaid Jr, Beauty and the Beast Jr, School House Rock Jr, High School Musical Jr, Mulan Jr and Once on this Island Jr. To find out more about our current productions and how to register, go to Current Production. What show are you registering for? Any additional info you would like to share about participant? Will you be sending in payment or calling in a credit card payment? Upon receipt of this form we will contact you with the official registration form. Enrollment is not guaranteed until payment is received. Thank you. School House Rock Live Jr Winter 2018. Click on the picture to read all about it. Beauty and the Beast Fall 2017. Click on the picture to read all about it. The Little Mermaid Jr Summer 2017. Click on the picture to read all about it. Annie Spring 2017. Click on the picture to read all about it. Cinderella Kids Summer 2016. Click on the picture to read all about it. Lion King Fall 2016. Click on the picture to read all about it. Sleeping Beauty Kids Spring 2016. Click on the picture to read all about it. Aladdin Fall 2015. Click on the picture to read all about it. Daily Voice Article about Mike Risko Music School's production of Disney's Aladdin Kids. Read about our standing room crowd! The Spring 2015 Production which was offered through the Ossining PTA at Claremont School in Ossining was The Duchess Bakes a Cake. Click on the picture to see more from this production. The Cast of The Duchess Bakes A Cake in Spring 2015 at Claremont School in Ossining.